This MST hub lets you connect two HDMI monitors to your USB-C computer. MST works on any Windows device that supports DP Alt Mode over USB Type-C, such as models of Dell Precision and Dell XPS laptops and ASUS ROG GL752. The MST hub also works with Thunderbolt 3 ports to provide Thunderbolt 3 to dual HDMI conversion.The USB-C HDMI hub is powered by the USB-C port, so you don't require an additional power adapter. This adapter works with USB Type-C devices that pass a DisplayPort video signal. The newest generations of laptops are more portable than ever. But, this could mean that you're left with fewer video outputs and confined to your laptop's integrated screen. This USB-C MST hub solves these problems by letting you connect two independent HDMI displays through a USB-C port on your computer, which makes multitasking much easier. Using the MST hub, you can extend your desktop onto additional monitors and stream independent content to each display. This makes it easier to multitask and increase your productivity -- perfect for creating a hot-desk solution with a wireless keyboard and mouse peripheral set. The hub also lets you mirror the same image onto multiple displays, for remote viewing applications such as digital signage. MST technology uses your existing video card to minimize the use of system resources while delivering Ultra HD 4K resolutions. 4K is supported by the latest A/V devices and offers four times the resolution of 1080p. Plus, because the MST hub can output high-definition 1080p, it's perfect for all high-resolution applications such as graphic design and CAD drawing. 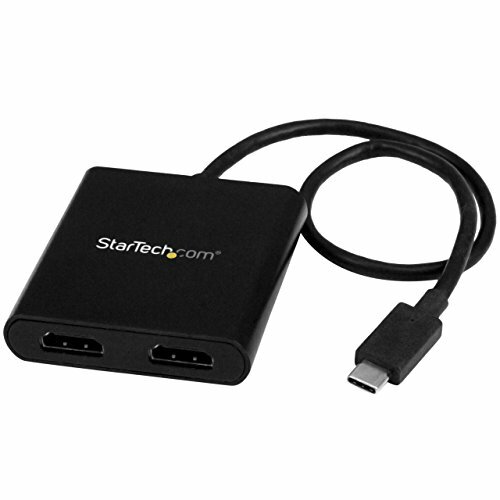 The MSTCDP123DP Thunderbolt 3 to HDMI MST hub is backed by a StarTech.com 2-year warranty and free lifetime technical support.